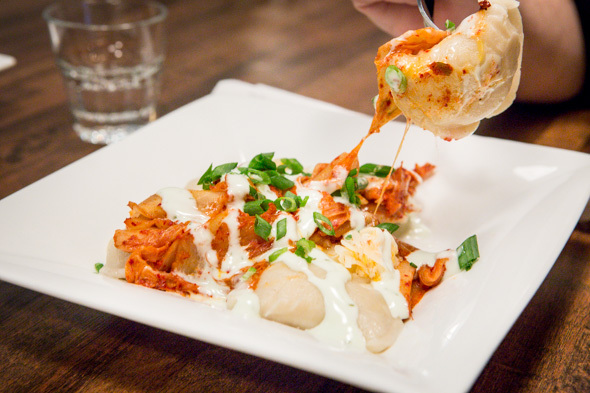 Loaded Pierogi (not to be confused with The Saucy Pierogi ) is a newly opened restaurant and vodka bar located at the base of Church Street where Great Burger Kitchen used to be. 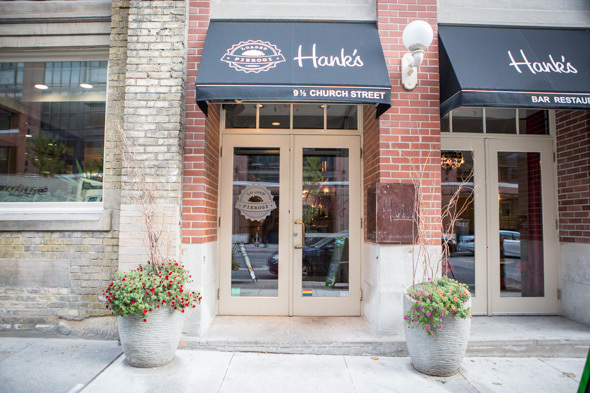 Owners Adam Dolley and Bryan Bruke (also of Hank's next door) have revamped the space, furnishing the warm room with a row of booths and a couple rows hightop counter space. 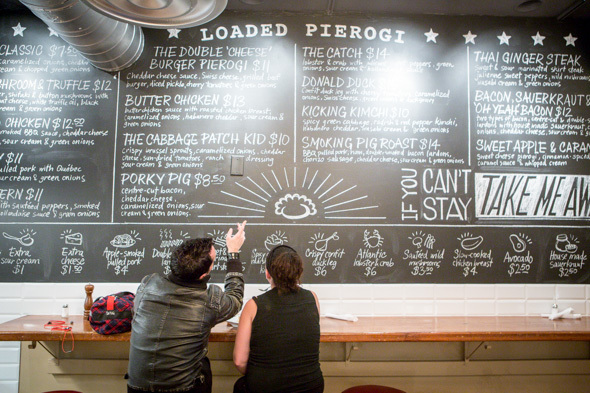 A blackboard menu lists 15 savoury pierogi dishes, each a variation on the same hand-formed potato and onion dumplings outsourced to a local Polish family. 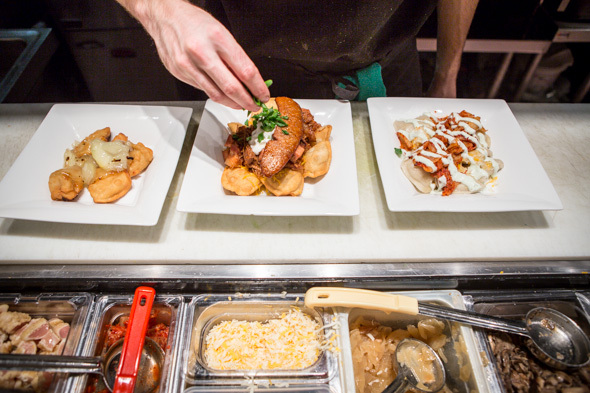 The choices begin with boiled or deep fried for each order and then, when it comes to toppings, diners can completely customize or select from tradional pierogi with cheese, sour cream and caramelized onion or unconventional variations like a butter chicken, duck confit or even lobster and crab with hollandaise sauce. I try golden-fried pierogi done Smoking Pig Roast style ($14), which means sprinkled with shredded cheddar that melts under a blanket of pulled pork, chunks of smoked ham and lardons and a chorizo sausage. The Kicking Kimchi ($10) is a vegetarian option that sees the spicy cabbage condiment piled on top a base of boiled dumplings with habanero cheddar and finished with wasabi cream and scallions. These are a little gummy and not as slippery as I'd like -- I'd do this one again only go fried all the way. 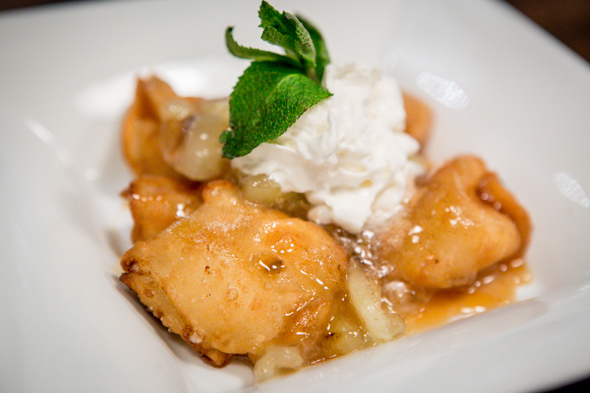 Sweet apple and caramel pierogi ($6.50) are the only sweet variation on the menu. These are filled with a mix of cream cheese and cottage cheese and are dusted in powdered sugar straight from the fryer. The toppings; caramel sauce, cinnamon spiced apples and whipped cream - are great together though verging on cloyingly sweet. 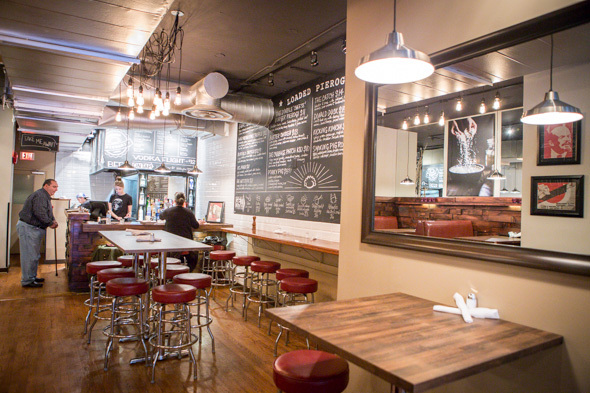 While the food menu seems a lot like you'd find on a food truck, it's the exceptionally well priced bar menu that turns this place into a truly worthy destination. 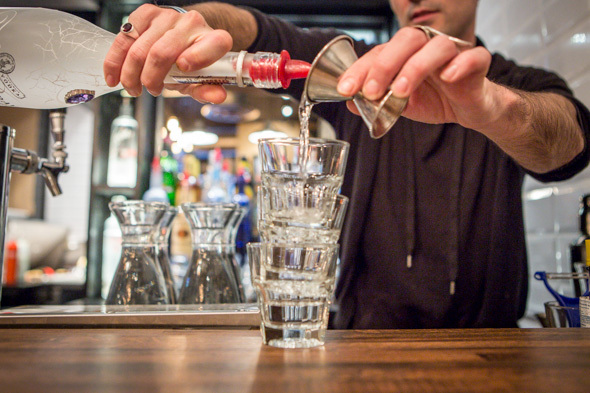 Vodka is obviously the main attraction on the drink menu and there are 15 labels broken down into bronze ($5), silver ($6) or gold ($8) distinctions - the best value is easily the $12 flights, featuring a shot from each category. On tap the signature Loaded Lager (from Wellington) is poured 20oz at a time for just $5. Take-away is available and encouraged, but if you're not in the immediate neighbourhood you can take advantage of the vast delivery area serviced by JustEat.